Active Controller Technology (ACT) allows you to control whatever plug-in effect or soft synth currently has focus. The controller/surface mappings for a particular plug-in work the same on each instance of that plug-in, whenever that instance has focus. You can change the focus to a particular plug-in by clicking either the plug-in’s interface, or its name in an FX Rack. Any plug-in that has ACT focus appears highlighted blue in the FX Rack. Figure 492. Plug-ins with ACT focus are highlighted in the FX Rack. Cakewalk has built-in mappings for all relatively recent Cakewalk plug-ins, however some older plug-ins such as the TTS-1 do not support ACT. Note: If you’re not using a Roland A-PRO controller, using ACT at this date means using either the ACT MIDI Controller Plug-in, or the Cakewalk Generic Surface Plug-in. The ACT MIDI Controller Plug-in has presets for most popular controller/surfaces that include built-in links between the knobs and controls on a given controller/surface and the cells on the Controllers tab of the ACT MIDI Controller property page. If you’re not using one of the factory presets (or there isn’t one for your controller/surface) OR if you’re using the Cakewalk Generic Surface Plug-in, you need to establish some links between the knobs and controls on your controller/surface, and either the cells in the ACT MIDI Controller property page or the radio buttons in the Cakewalk Generic Surface Plug-in property page. To do either of these, see Assigning controls on your controller/surface to cells in the ACT MIDI property page, or To Use ACT with the Cakewalk Generic Surface. Selected a preset from the ACT MIDI Controller property page Presets menu, either a factory preset for your controller/surface, or a self-created preset (if there is no preset, see Assigning controls on your controller/surface to cells in the ACT MIDI property page). Enable ACT in the ACT MIDI Controller property page by enabling the Active Controller Technology Enable check box. 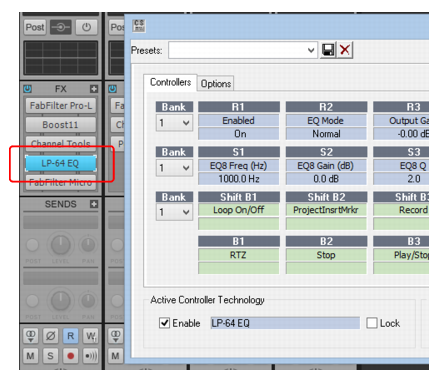 The ACT MIDI Controller can enable this check box from the controller/surface itself. Put the focus on the plug-in that you want to control. The name of the plug-in appears in the Active Controller Technology field of your controller/surface’s property page, and the current mappings appear above the Knob and Slider fields in the controller/surface property page. Adjust the plug-in’s parameters by moving the controls on your controller/surface (if you’re using a self-created preset for the first time, you may have to create your own ACT Mappings before you can do this step—see the following procedure). If you want to control only this instance of the plug-in with your controller/surface, enable the Lock check box in the ACT MIDI Controller property page, or enable the ACT Lock button in the Control Bar’s ACT module. If you are not locking the controller/surface to a single instance of a plug-in, put the focus on another plug-in, if desired, and adjust its parameters. Enable ACT in the ACT MIDI Controller property page by enabling the Active Controller Technology Enable check box. Enable the ACT Learn Mode button in the Control Bar’s ACT module. Open the property page of the plug-in that you want to control. Click the parameters in the property page that you want to control. Move the sliders/knobs on your controller/surface that you want to use to control the parameters with, in the same order that you clicked the parameters (you can reverse steps 4 and 5). Disable the ACT Learn Mode button in the Control Bar’s ACT module. A dialog box asks if you want to keep your assignments. Click Yes or No. Any assignments you keep are saved automatically as soon as you disable the Learn button. These assignments are global, so they are the same for every project. In the property page of the plug-in that you want to control, click the parameters that you want to control. Move the sliders/knobs on your controller/surface that you want to use to control the parameters with, in the same order that you clicked the parameters (you can reverse steps 6 and 7).